More darlings they refuse to kill. More baggage and red tape. Someone will always have more than you. There will also always be other people who consider you the successful competitor who has more than they do. This weekend was Sylvia Weinstock's birthday, and since I like to celebrate birthday seasons, today in her honor I'm reposting a conversation we had in January 2014. Aside from being brilliant, witty, and a savvy businesswoman, Sylvia is the type of person who, whenever I see her, grabs my hand and asks about my health, love life, family, and business — always in that order. She is a woman whose success is defined by right priorities. 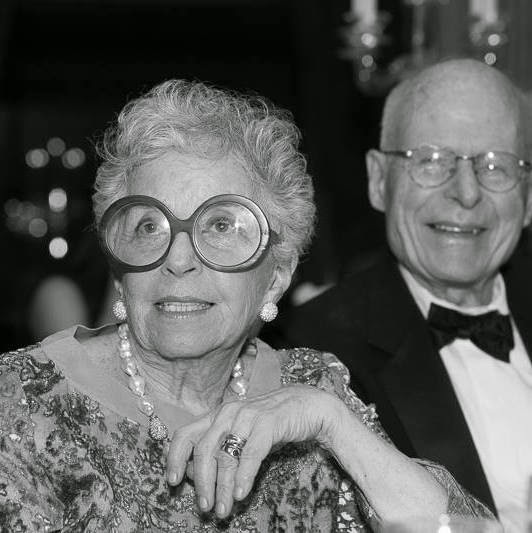 Here she shares her secrets to a 65+ year marriage, her thoughts on business and the wedding industry today and, of course, the story behind her iconic glasses. You and Ben have been married for over 65 years. How did you two meet? I met him when I was 17. A group of cousins and friends went to the beach. All the girls had their hair done up and makeup on and I wanted to go swimming in the ocean but we had to use the buddy system. One young man said he'd go with me, and that was Ben. Would you call it love at first sight? No. I don't think love comes at first sight. I thought he was cute, smart, and I liked him. Love comes over time. In those days, nice girls went home or rich girls went away to college. You did not share an apartment or a bed with a young man. Nice girls didn't do that in my day. Over time we had a lot more affection and chemistry and we decided we wanted to get married. It was my 19th birthday and his 24th birthday. We were married on a Friday and went back to school on a Monday. I was a teacher and school psychologist and I got Ben through law school and we started a family. We are now married 65 years. We live in a world today of instant pleasure and I don't think too many people understand what it means to save your battles, compromise, and not have everything your way. Too many people today are spoiled and entitled. This business of love at first sight: love is something that has to simmer and stew awhile. I think people confuse chemistry and love and affection or sharing similar views as love, but that's not love. You don't fall in love, you fall for a person because you like them. You become fond of each other, but love is much deeper than a feeling that you have. You meet someone and you find them physically attractive but that's not love and then they finally get married and find out, boy, I really don't like them anymore. Easy. I married someone I liked, someone who supported some of my decisions, someone who supported me to grow and be my own self. I was encouraged to do the things I like to do, not to be a copy. We discussed major things like should we do this, should we do that, what do you think? It was mutual respect. We have a good relationship. Our daughters are all married over 25 years to their partners. I think we've set a pretty good example for them at home. I have a master's degree in psychology which I use all the time. Being a kindergarten teacher was great training and taught me a lot of patience. Speaking of your master's degree, you're known as the Queen of Cakes, but you started that business at age 50. Can you tell us a bit about your career path prior to cakes? Part of my background of the era I was in, women didn't have the same opportunities they do today. They were told they could be a nurse, teacher, secretary, or get married. Those were the options and teaching appealed to me the most. I found I really enjoyed it, I was good at it. At that time I had a bachelor's degree, and decided I need a master's. The master's was from Queen's College. In those days college was free. Hunter was free, Queen's cost money but it was affordable. Then I took courses at Columbia and NYU. I was a homemaker and mother and I entertained at home and I loved cooking and baking. So going into cake making was an easy thing. I started off making apple pies and strudels and tarts and cheesecakes. There was no one making beautiful and delicious party cake. I started with a small wedding cake, a birthday cake, and grew from there. I've been in Manhattan since 1980 and started a few years before that, so it's been close to 40 years. How has the wedding industry changed over the years? I think radically. When I started it was much smaller. People got married but didn't have grand events. They didn't expend as much on the planning. There were always extravagant weddings, but not to the degree they are today. Weddings have become like coronations. Very grand, occupy the bride's family for a year, maybe even two. Planning and the gowns and the shopping has really overtaken their lives. It's become such a fantasy for them. I often wonder what happens when the ceremony's over. A lot of people can't face the fact it's over. For some of these mothers it's postpartum, it took so much energy, it's like "now what's left?" Mothers come in with a stack of clippings they've been clipping for ten years. For some it's their wedding, not the daughter's. I have a number of daughters who have recognized that and during meeting will turn to mom and say my wedding not yours. And then there are altercations there. The mom says I'm paying for it. I'm of two minds of this: I like people to spend money because it supports the industry, provides people with a paycheck. At the same time, they could buy a house with the money they spend on five hours. I love a celebration, I think parties are wonderful, but I never think people should go into bankruptcy or borrow money for a wedding. Do what you can afford in the most tasteful way possible. Maybe that means a backyard barbeque. I've always liked a good hot dog or a hamburger. Weddings are to share in the joy of the family and not to look and see what they spend. You go with a full heart because you love these people and what they can do is the best they can do. What are your thoughts on being successful in a saturated market like the wedding industry? My feeling is you are not the client. You are not the client. You are the servants in a sense. You are working for them. You walk in the back door and you leave the back door. You are not a guest unless it's very special. Your job is to make the client happy, you are not a guest. I see attitude in a lot of the vendors, too. They think they're so special. They're special at what they do, but need to remember that you're working for the client and getting paid for it. Some of the party coordinators are selling a sense of style but don't have any style themselves. They look like an absolute mess, I would never use them. I want to see what they look like before I buy their level of taste. You have to sell yourself, not just by your talent but by what you look like, too. You're in the design business, you have to look like you have great taste. There are vendors who bring clients in my shop and the vendors are sloppy, their hair needed a job done, their nail polish was peeling. Sloppy, sloppy. I'd never use them as a party coordinator. I wouldn't take their advice because I look at them and they're a mess. I can't imagine that a sloppy looking person is going to turn out neat, precise work. I was talking to one coordinator who has some taste. She said "I would never let my brides wear that." And I said, "Wait a minute you can advise not to, but if I were your bride I'd want to know why or dismiss you." It's a collaboration. It's not your wedding, it's the girl's wedding. You can refine it, upscale it, but it's her wedding. I like honesty. If you're in a business, you have to be legitimate. I do not like commissions. It's a tricky subject, I get paid for what I feel the value of my product is. If someone wants to make money on it they better tell the clients. These party coordinators say, "Okay you're going to get the cake, but I want 10%." Uh uh, it doesn't work. It's indigenous in the business and it's a bad thing. Then they say, "I'm bringing you the work." No, my work speaks for itself. I don't give you 10% of my labor. How you address that, I don't know. The other issue is this: you cannot price a unique item. If I use Colin, Ed, Marcy, Todd, David . . . each is unique in what they do. You can't price across the board. Each person does their own thing, it's not apples to apples. Even apples that grow on the same tree are not always the same shape. It comes down to whose design comes closer to my vision and whose price point I can afford. It's like saying I want a wedding dress. You can go down a list of names but you have to try the dress on to see what fits well, what looks good on you. You just can't compare prices on the internet. You really can't. Sylvia with Janet, one of her daughters. There's been a lot of buzz about women "having it all" after The Atlantic piece by Anne-Marie Slaughter and Sheryl Sandberg's Lean In. What are your thoughts on "having it all?" You can have it all, but you have to move the numbers around. It's not quantity of time it's the quality of time. You can be a working mother but when you come home you don't pass the kids over to the maid, on weekends to the maid or to play school where you're not involved. Take them along when you're working so they can see how mommy or daddy work. It means you spend free time, quality time with the family. I've seen a lot of professional women handle both sides very well and have seen some schlep their kids off to the maid. I know a career woman who sent the housekeeper to her own daughter's bat mitzvah. In my eyes that's not quality time. It's okay to take kids on playdates, it's okay to take a few hours off. I think women are superior creatures, we can do it all. I know women that do. I have a client who was a doctor and raised six kids. They were terrific, they thought mom was terrific and always had quality time with her in spite of the fact that she was a working doctor. I think more and more the commercial world will work with the mother. A lot of women are now negotiating their job to work four days a week instead of five. What are your thoughts on dads who refer to spending time with their kids as "babysitting" rather than parenting? They should definitely use the word parent. Two people make a family, two people make a baby. There are many women who are having children without a husband in sight. I don't know how they handle that. They may have male figures who help pitch in, but I think in what we call marriage today, we have two, whether it's two women, two fathers or a mother/father combination. It's collaboration and the burden shouldn't be on one if there's another one in view. A young man working for me in the office: his mother came out, divorced, married a lady friend. This young man who works for me has the benefit of three parents. That's a great thing. I was born and bred in New York and plan to stay. I love the city, the diversity, the energy, the excitement. I have lots of young friends. I am never going to consider a retirement village, it would kill me. New York is a great city. I think the country needs to have a better work ethic, too. There are little pockets of the industry that feel that good is not good enough, it has to be the best and you will find artisans who feel that way. In general, I feel this is a national problem. I don't think we have that enormous sense of pride of workmanship. Will you share the story behind your iconic glasses? I was walking down a street in Palm Beach and saw a large pair of glasses in a shop window and thought, "Those certainly make a statement." We looked at the price and my husband said, "They are so expensive, you can get them cheaper in NYC," but I couldn't find them. So I bought them. It was a moment of emancipation. Then I got the bill. Ben said, "What, are you crazy?!" And I said, "I can't wear diamond earrings with these glasses, think of all the money you just saved." Now people recognize me because of the glasses. Cakes are signed with glasses as the signature piece, and they've been copyrighted and trademarked so that they're mine. They are very expensive. I have one pair. I can't really afford two pairs, they're a lot of money. Everything is relative in today's world. You should take every day as a blessing, and enjoy what you have. Don't let what you don't have destroy you. We're a spoiled society in general, we hunger for things that are unimportant. Health, then love and happiness. That's what matters.